I love Italian food, and this is the best homemade chicken carbonara recipe, and one of my favorites. Rich and flavorful, it makes a easy meal when time is limited. Top it off with crispy bacon pieces and serve with crusty homemade Italian bread. More of my favorite Italian recipes at the end of the page. In a large heavy skillet, fry prosciutto until cooked (not crispy); drain and set aside. Fry the chicken strips and onion in the bacon fat until meat is cooked through. Drain well. Discard the bacon fat. Meanwhile, in a large saucepan or dutch oven, whisk the sauce ingredients together and slowly heat to medium-low (no higher or the eggs will scramble). When the meat/onion mixture and pasta is cooked and drained well, add that to the sauce ingredients. Cook until it is thickens and season with more salt and pepper if you need to. Serve with a salad and crusty butter bread. So delicious. Use pancetta instead of bacon if you wish. Heat oil in heavy skillet over medium heat. Add bacon, garlic, pepper and oregano. Cook until garlic is golden and bacon is on the crisp side. Remove from heat. While the sauce is cooking, boil pasta according to package directions. Drain and put on a platter. Gently stir in eggs, bacon sauce and Romano cheese. Sprinkle with mozzarella cheese and place under the broiler for a few minutes, or until cheese is melted. 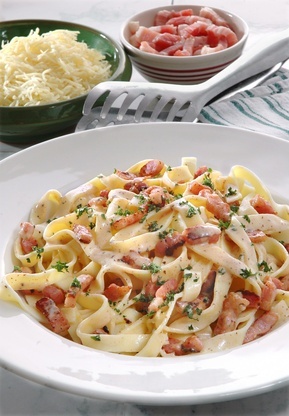 I have more than a chicken carbonara recipe, please check out more Italian recipes below.